Hiring the right UX designer- avoid these stupid mistakes! Summary: Hiring UX Designers and UX managers or UX consultants can be difficult especially for product, marketing, engineering or HR folks who are unfamiliar with what a UX designer ought to be doing to generate real value. Know what you are shopping for, so you get what your organization needs! Better yet avoid these mistakes made by those before you. Good UX hiring contributes to reinforcing an Outside-In Design organization. We have written about hiring the wrong UX agency and we mentioned 10 issues, with these 3 pertaining to UX Designers. These big mistakes are still being made, as everyone rushes to figure out UX. 1. You assume UX means Photoshop (Sketch etc) or just wireframes. UX derives from taking a systematic research-based approach to design (think lots of up-front planning). Decisions are made based on empathy gained from user research (field studies and usability testing). 2. You think your UX Designer can do UX. UX Designers are typically either Interaction Designers (more UX oriented) or Visual Designers (more art or graphic design oriented). The term UX Design is a mish-mash term that is extremely ambiguous, and can mean many things, yet we all use it! Assess your UX designer's true capabilities, not perceived ones. UX and the academic field of Human Computer Interaction are multi-disciplinary and come from marrying research with design, so expect UX Designers to do research and wireframes and Visual Designers to do mostly graphic design and help with wireframes. Note: If you are hiring or looking for a hybrid role (part research/ part or part designer) be clear about the precise scope and actual capabilities of that person or team. Trying to pile it all on to get a unicorn can end up giving you a pack mule, too burdened to perform well. 3. Being fooled by eye-candy. Sounds easy to detect, but we humans do it all the time! In one of our B2B buyer persona field studies, an executive director said (of her buying decision) "I don't look at the interfaces of the vendor I am buying from until I have done my due diligence. I don't want to be biased by the visuals, otherwise I get pulled in and my decision gets biased too early". Great advice for UX hiring! Assess process maturity, not just visual capability. 1. The job asks you to code. Like focusing on "UI" visuals, you cannot expect a developer (front-end even) to do amazing UX. There are some that can (think unicorn) but they hardly get time to validate with users, since they are tethered to dev team needs. 2. The job reports to Engineering or to Product. The issue here is being compromised by a dev or product agenda. If this happens in an organization with low UX maturity (that's most organizations), it can kill off UX innovation. If it is done deliberately within a UX Management approach that is part of a serious UX roadmap (versus a lip service one), it can work-- depending on your organization's unique conditions. Product is actually a popular place for UX these days as a way to circumvent being compromised by a technology view. However, watch the video above for issues with Product Managers who don't value UX. 3. Companies that hire more Product Managers than UX Designers. This points back to UX maturity and how your organization is conducting it's challenge of UX management. 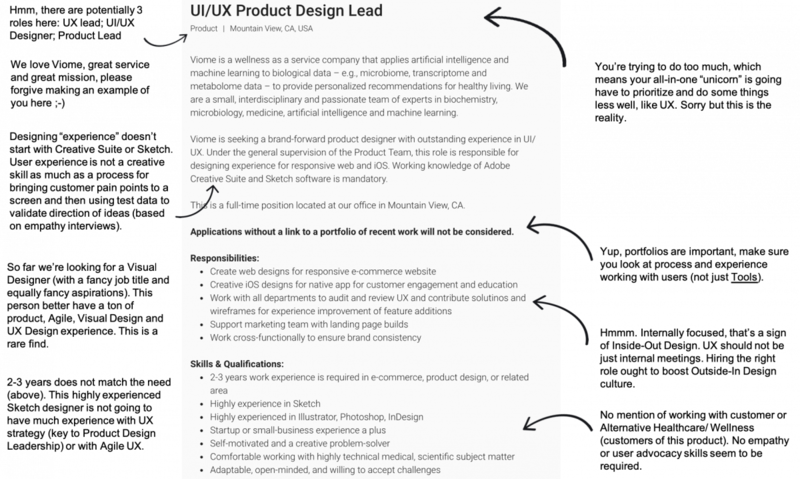 Next, we mentioned in this post about getting clear about UX roles is key to UX Management. Let's face it, your UX job description says a lot about your organization. Specifically, job posts reflect your UX maturity. They reflect your internal thinking, politics and ideas of organizational structure. Job and role assignment reflect how well you really understand design and UX in particular. To look and learn from an example, here's a job listing with mistakes reflecting the UX maturity of this start-up. Note this is classic with start-ups but also just as prevalent in enterprise environments. [This job was posted late 2018, so things may have changed. Also judging by the service experience we evaluated, there were some clear issues that could have been solved with a mature UX approach]. 1. 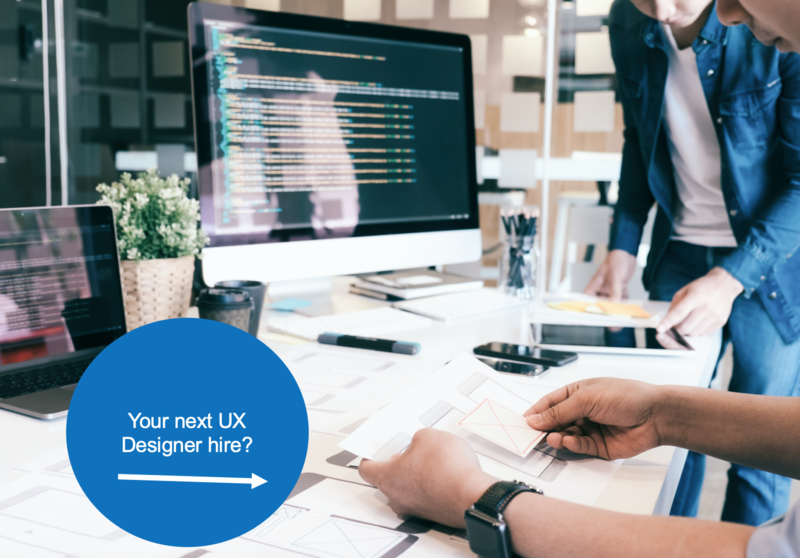 Hiring a UX person (UX designer, UX manager, UX researcher etc) requires that you first know exactly what that role is supposed to do, only then can you find the right fit for your expectations. 2. Most managers hire UX designers thinking they can do what they want them to do, versus what they should and can do, which is to focus on UX not just UI. 3. Hiring shows where your organization is at, and where you want to go, for the moment. Sure, you can adjust and change course, but don't waste your time and money by hiring or "shaping" an existing high-value role (UX design) into your idea of what value it offers. 4. All UX hires should be part of building a User centered engineering and product strategy that paves the way to continuous value generation. Good UX done well, by the right people, can yield ongoing value and ROI. See the ROI of UX for specifics (INFOGRAPHIC).